The Tattersalls sales ring swelled to bursting point in anticipation of the arrival of a Dubawi colt out of Lord and Lady Lloyd-Webber's wonderful broodmare Dar Re Mi. Already a brother to the Group 3 Tattersalls Musidora Stakes winner So Mi Dar and the listed-winning filly Lah Ti Dar when the catalogue was published, the colt subsequently received substantial catalogue updates. One was via Lah Ti Dar who finished second in the Group 1 St Leger and the other was from his year older brother Too Darn Hot who won the G2 Champagne Stakes and is the current anti-post favorite for next year's 2,000 Guineas. Sheikh Abdullah Almalek Alsabah made much of the early running along with Jamie McCalmont before Japanese trainer Mitsu Nakauchida and Shadwell Estates' Angus Gold took up the running. 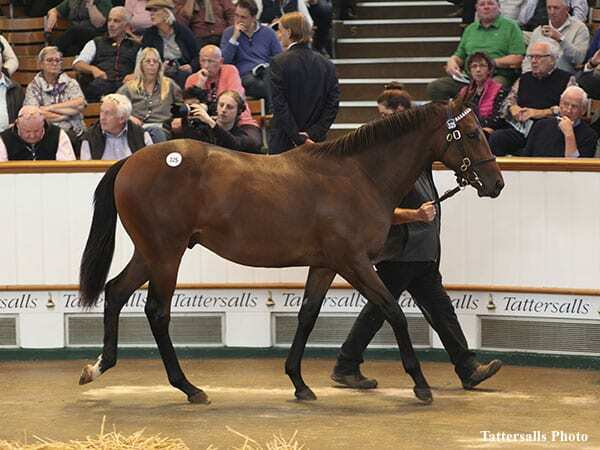 Finally David Redvers joined in to secure the colt for 3,500,000 guineas (US $4,854,387), the highest price for a yearling anywhere in the world this year and the second highest price for a yearling colt sold in Europe. He was bred and sold by Lord and Lady Lloyd Webber's Watership Down Stud, and Lady Lloyd Webber was in the sale ring to witness the sale. This entry was posted in Bloodstock and tagged Dar Re Mi, David Redvers, Dubawi, Lord and Lady Lloyd-Webber, sheikh fahad al thani, Tattersalls, tattersalls october yearling sale by Edited Press Release. Bookmark the permalink.